This post continues, slicing the 9 patterns of More Extreme 200, and conducting trials of the divided sets. A brief, but decisive cluster merge ends the struggle. Antoine was right. #200 is outstanding. 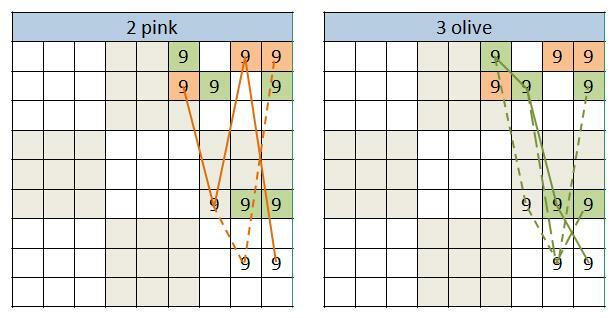 Following a pink/olive analysis on the 9 patterns, I suggested you try another one on the remaining 9 patterns, with 9r2c6 shaded pink. Here is my division, with two pink patterns with one clue, and three olive patterns and one clue. A pink trial throws out five, and the olive trial, three. It’s generally best to try the more decisive side, because you want the trial to come to a conclusion, positive or negative. 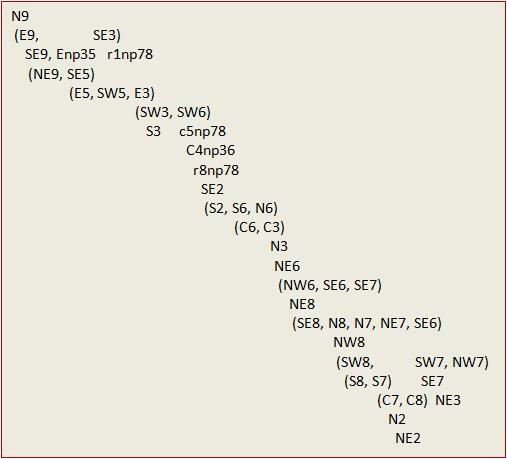 In the pink trial, the remote pair =>9r1c8, E3 => SEnt278 =>r9np36 =>SE8, removing all 8 from c8. As we install the olive pattern set, the remote pairs seen in the pink trials come back to haunt # 200. The removal of 9r1c8 allows 3r6c8 to produce five 5 conjugate pairs in a loop, and therefore odd sided slink loops in 7 and 8, making a solution impossible. This also confirms 3r7c8 as a necessary guardian. The final collapse unravels a curtain of naked pairs which explain why #200 was so extraordinarily tough. Let’s close the review with a round of applause for Antoine Alary. Wear your helmet, my man. Next I’m going tackle the extremely tough, but popular, Weekly Extreme Competition series, at www.sudoku.uk . My review puzzles start with #426 and end with #435. All of the puzzles are available, packaged with their solutions, in an archive table on the competition site. 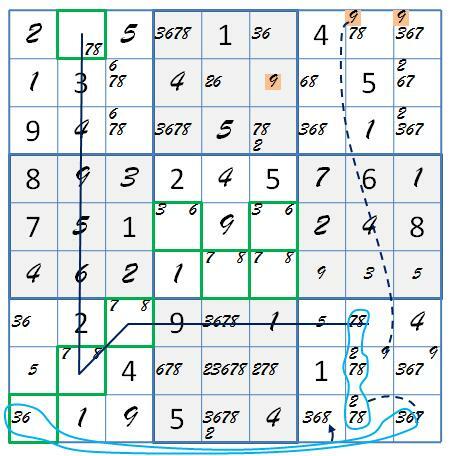 The competition is to complete each puzzle within a week, and key in the solution to the site before the midnight deadline. Winners over the whole year get their names on the honors list. I hope Weekly Extreme competitors will follow my posts, and comment on them. If you know any, let them know about it. Of course, we will always be seeking humanly efficient, entirely logic based route to the solution, which is not the only way to succeed in the competition. 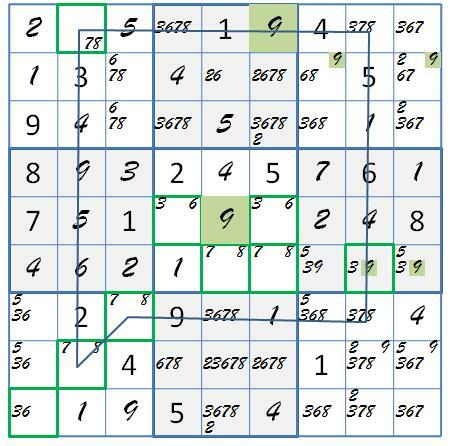 But these compeititors are serious Sudoku solvers, and could easily become sysudokies as well. This entry was posted in Alary, Extreme Solving, Puzzle Reviews and tagged Antoine Alary, finned X-wing, guardians, More Extreme 200, pattern analysis, pattern slicing, pattern trial. Bookmark the permalink.